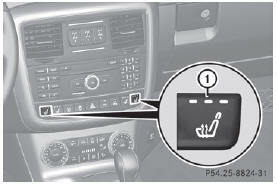 Repeatedly setting the seat heating to level 3 may result in excessive seat temperatures. The health of passengers that have limited temperature sensitivity or a limited ability to react to excessively high temperatures may be affected or they may even suffer burn-like injuries. 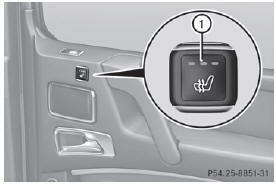 Therefore, do not use seat heating level 3 repeatedly. The red indicator lamps in the button indicate the heating level you have selected. ► Make sure that the SmartKey is in position 2 in the ignition lock. If the battery voltage is too low, the seat heating may switch off. One or more of the indicator lamps in the seat heating button are flashing. ► To switch on: press button 1 repeatedly until the desired heating level is set. ► To switch off: press button 1 repeatedly until all the indicator lamps go out. The system automatically switches down from level 3to level2 after approximately 8 minutes. The system automatically switches down from level 2to level1 after approximately 10 minutes. The system automatically switches off approximately 35 minutes after it is set to level 1. If the on-board voltage is too low, the seat heating is switched off automatically. ► Switch off electrical consumers which you do not need, such as the rear window defroster or interior lighting.